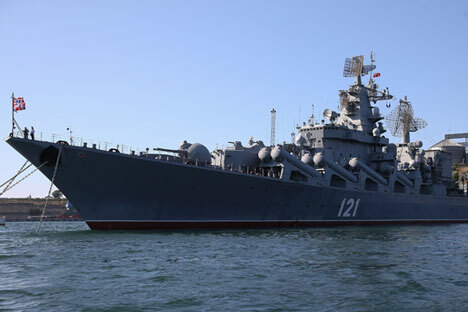 The flagship of the Russian Black Sea Fleet missile cruiser of the Guards "Moscow" in Sevastopol Bay. As warfare changes with modern geopolitics, having high-precision missile assets at sea has become an integral part of U.S. and now Russian military strategy. A new generation of smaller ships is already paying off as Moscow’s military campaign in Syria demands precision strikes at long range. On Oct. 7, 2015, Russian Caliber cruise missiles were launched from the Caspian Sea at terrorist targets in Syria. Seemingly unremarkable small missile ships of the Buyan-M class that recently entered service in the Caspian flotilla delivered the strikes, controlling their flight over the territory of three countries and ensuring an almost 100 percent accurate hit on the targets, the rockets deviating no more than two meters from their designated coordinates. On Nov. 17, an identical missile launch was made from the eastern Mediterranean, this time aimed at Raqqa, the northern Syrian capital of the self-proclaimed Islamic State (ISIS), which was still out of the range of Russian air strikes. The successes of the Russian navy in the Syrian campaign are largely due to the latest developments in the domestic defense industry. When the Soviet Union collapsed in 1991, the most modern facilities for the construction of surface ships were located on the territory of newly independent Ukraine. It was there at the Nikolayev shipyard that the most formidable ships of the Soviet fleet were built. The Moskva went down the slipway in Nikolayev in 1983 and went on to take part in active combat operations, since after 1991 it was transferred to Russian ownership. More than two soccer fields long, the Moskva has a maximum speed of 32 knots, carries helicopters and, more importantly, can launch missiles. Its 16 Volcano anti-ship missiles can repulse almost any attack from the sea, ensuring the unhindered delivery of the type of strikes witnessed in Syria.